It saddened me to read today of the plans of Black Lives Matter St. Paul to disrupt the Twin Cities Marathon this coming Sunday, October 4, 2015. The protest organizers say they hope to block the road at some point on the course to prevent runners from finishing the race. It’s hard for me to come up with coherent thoughts on this, so I am just going to post the thoughts that ran (no pun intended) through my mind as I read the articles, the comments, and the Facebook replies. – I cannot see the link between police violence against blacks and the Twin Cities Marathon. Yes it’s a high profile event. Yes it is something that runners are privileged to do. But if you wish to highlight and protest police violence against blacks in your community, why choose an event at which the police will be ensuring the safety of the community? Disruption of such a positive community event is not likely to garner support of the Black Lives Matter movement. – Why target a sport in which so many of the professional athletes are black? Twin Cities Marathon does not yet have up the profiles of the professional athletes running this particular race, but you only have to look at the finishers of the world marathon majors and Olympic races to know that the sport of running benefits many blacks. – And forget about all the professional athletes, what about the ways in which running benefits the everyday athletes of all backgrounds? Don’t the protesters know that Black Girls RUN!? At any rate, my thoughts will be with all of the runners and the protesters on Sunday. May the runners finish safely without interruption and may the protesters stay safe as well. I crossed another item off my bucket list recently! 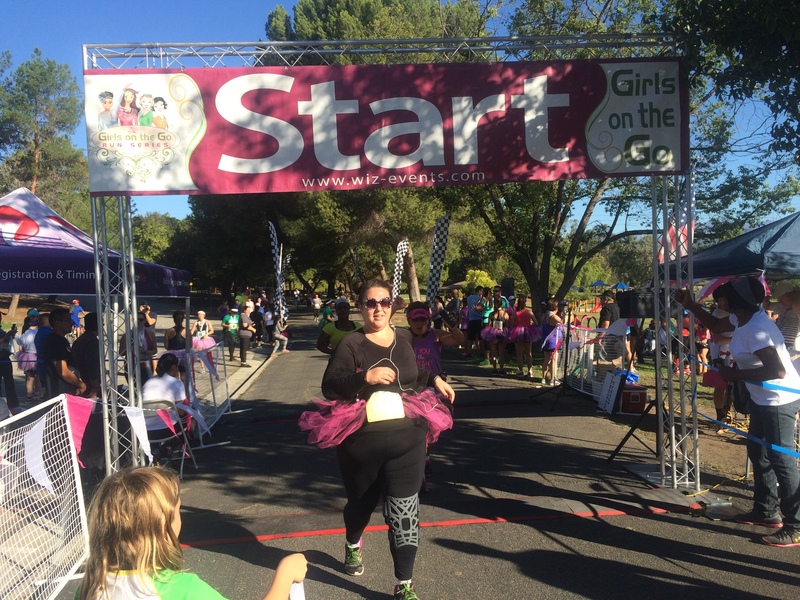 It wasn’t a marathon, half marathon or any other goal race — it was volunteering at a race! 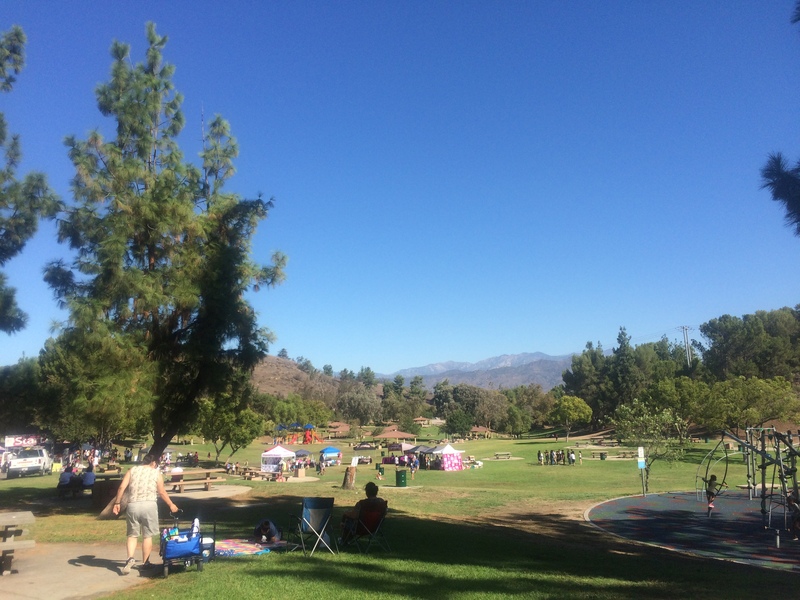 On Sunday, September 20, 2015, my three girls and I got up at 5:45 a.m. to drive out to Bonelli Park in San Dimas, California to volunteer at the Girls on the Go Los Angeles Half Marathon, 10K, 5K and 1K races. What a fun morning in a gorgeous setting! In a stroke of good luck we got the best assignment in my opinion: handing out the medals at the finish line! But first we had to unwrap hundreds of individually plastic-wrapped medals. I had no idea the medals came that way. Of course it makes sense, you wouldn’t want those shiny medals clanking against each other and getting dinged up before race day, but I never gave it any thought before. Which is exactly why every runner should make the time to volunteer at a race — to better understand and appreciate all the volunteers who make it happen! If you are looking to boost your mood and your sense of community, get out to a local race, volunteer your time, and watch a few finishers come in at the finish line. 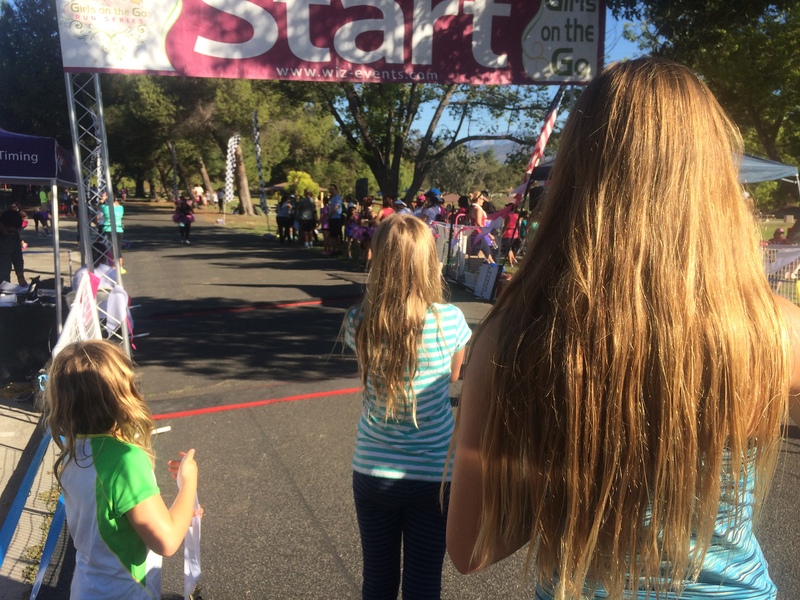 As an unexpected side effect/reward for volunteering, my 13-year-old got inspired to sign up for her first half marathon. We’ll build up to it by running the Brea 8K in February, maybe the La Habra 10K in March, and then a half marathon (still to be decided — her dad needs to help choose the race for his first half marathon too!) in the spring. Have you ever volunteered for a race? I should have been jumping for joy, but I was surprised to find that my joy was dampened by some other emotions. I remember all too well the feeling last year of getting a very different email, one that said my qualifying time of 3:44:26 did not meet the minus 1:02 cutoff for Boston 2015 and I would not get to race that year. I re-doubled my efforts and stayed strong at the end of the Phoenix Marathon last February to make sure that I qualified this year by more than the standard minus five minutes, coming in at 3:36:58 for a BQ minus 8:02. Online speculation predicts that this year’s cutoff will come in somewhere around minus 1:30 to 1:50, even harder than last year, and my heart goes out to all the people who worked so hard to beat the qualifying standard and yet will face the disappointment of that “we’re sorry to inform you” email. I hope the BAA comes up with a better solution, either by tightening the qualifying standards or figuring a way to expand the field safely to allow all qualifiers to register if desired. In the meantime, I will do my best to appreciate the opportunity to run the race. I am particularly grateful to my parents who generously offered to pay the $180 registration fee! It feels very strange to be registered for my seventh marathon when I have yet to complete my sixth! I never do that! I always wait to see how I feel after a race to set my sights on my next goal and my next goal race. But this time I am in the middle of training for REVEL Canyon City, which takes place November 7, about 6.5 weeks from now! Training is going well, although I have regretted my choice of training plan this time around. I thrived on the Run Less, Run Faster and Smart Marathon Training plans that called for three targeted runs per week plus two cross-training sessions and some strength training. Bumping up to 4-5 runs per week plus training on some hills to get ready for Canyon City left me with a painful case of shin splints — medial tibial stress syndrome (MTSS) to be exact, which is a fancy way of saying pain on the inner part of the shin. I have managed to run through it over the past five weeks while trying many different remedies (rest, ice, compression socks, strength training) which I will be happy to share once I have beaten this overuse injury once and for all. I’m happy to report that this morning’s 8-mile run was my first completely pain-free run in a long time and it felt fabulous. I lost a bit of the joy of running when I was feeling the weight of injury, and it felt so freeing to run strong this morning (fingers crossed, knocking on wood). 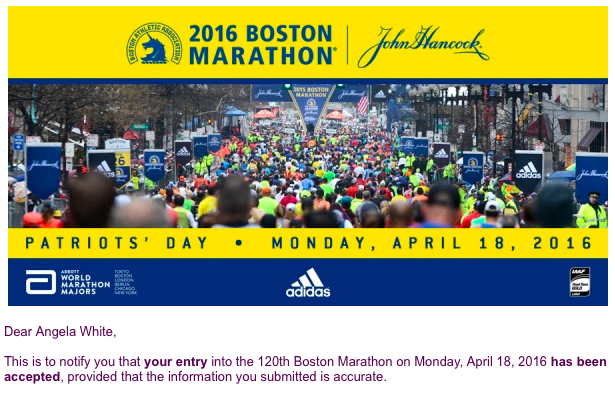 Do you have an opinion on the Boston Marathon qualifying standards and registration process? Are you training for anything right now?